Elastic cord secures HandlePod to a light pole. 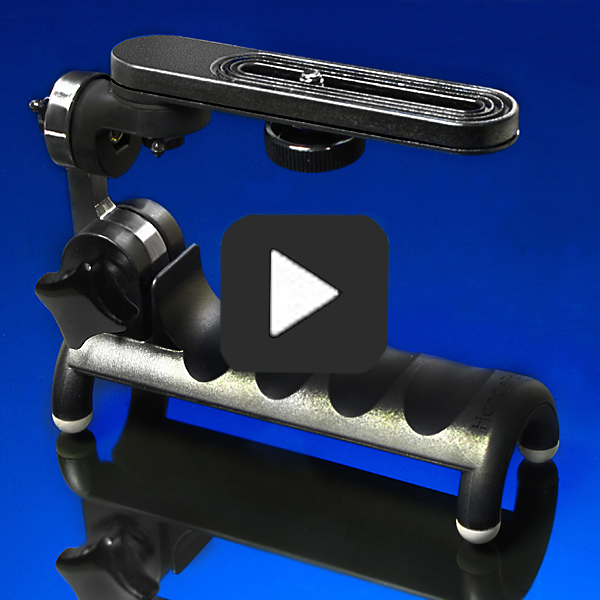 The elastic cord supplied with HandlePod is an efficient means of attaching the camera mount to many solid supports. It stretches to over four feet to accommodate large objects. It can be easily tightened simply by taking it out of the slot, pulling it to apply more pressure and snapping it back in the slot. And it is strong enough to hold many times the weight of the heaviest camera without breaking or coming loose. It is an excellent system that has significant advantages over Velcro straps, flexible minipod legs or other means of securing a tripod alternative to support objects. Because it is small, thin and stretches to a considerable length, the elastic cord takes up very little space and is easy to secure. But care must be taken to keep it with the HandlePod when not in use. It is best to wrap it around the Handlepod and secure it in the slot where it is out of the way until needed. Try to avoid removing it completely and storing it someplace other than on the HandlePod. Because it is so small it is easy to lose track of the cord. If you do lose the elastic cord, it is easy to replace. Some sporting goods stores and many fabric stores sell 1/8th-inch nylon shock cord by the foot for a nominal price. Twenty-eight inches is the standard length. If you can’t find a local supplier, HandlePod LLC will provide a replacement. Just send a stamped, self addressed envelope to: HandlePod LLC 777 Glenview Drive #1102, San Bruno, CA 94066. A replacement nylon cord will be sent to you at no charge. Thank you for choosing HandlePod. This entry was posted in Camera Stabalization, Tripod Alternative on March 22, 2015 by main user.